Thirty-one people have died in D.C. traffic crashes so far in 2018. That’s one more than the number who died during all of 2017 and four more than the number who died by this point last year. Roughly half of the people who have died in 2018 were walking or biking when a driver struck them. In one case that took place last month, the victim was riding a scooter. Although the overall number of traffic fatalities in the District has decreased as compared with the levels seen in the early aughts—with a peak of 72 deaths in 2001—they have been creeping back up over the past several years. 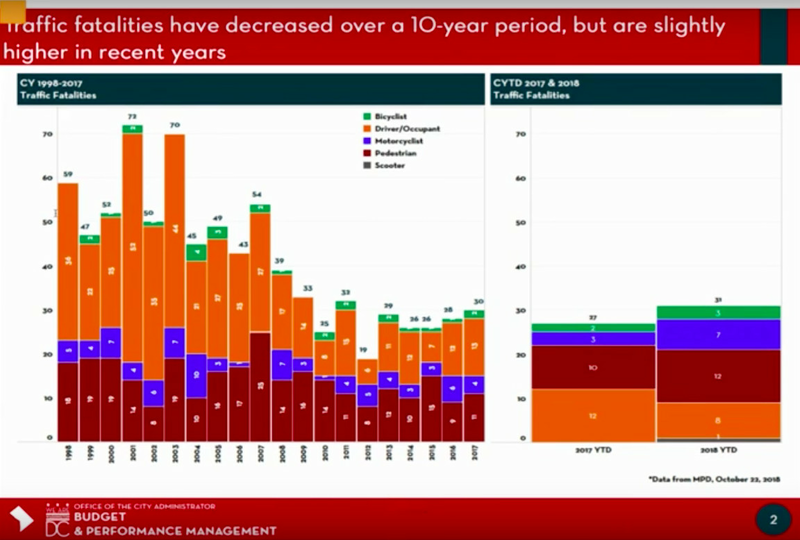 D.C. has recorded between 26 and 30 traffic fatalities a year since 2013 and has not observed a decline in the annual count since 2014. Headline-grabbing cyclist and pedestrian deaths over the past few months have put these figures in high relief. So did a September meeting of District leaders and advocates who had gathered to discuss the “Vision Zero” initiative to reduce—and eventually eradicate—traffic fatalities through better enforcement of laws, better street engineering, and better education. 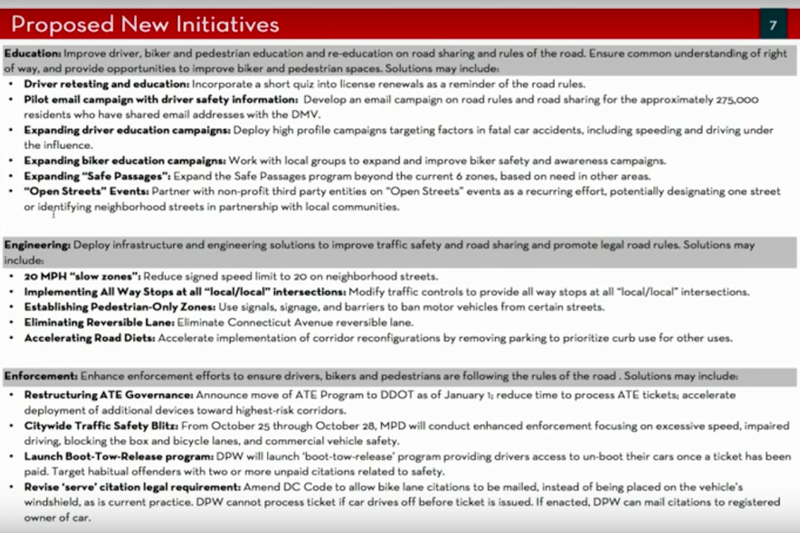 Many at that meeting, including public witnesses and elected officials, criticized the official efforts seen since 2015, when Mayor Muriel Bowser formally launched Vision Zero in D.C. On the heels of such criticism, Bowser’s administration on Tuesday unveiled a slew of plans and proposals geared toward refocusing the initiative, and presented them to policymakers. 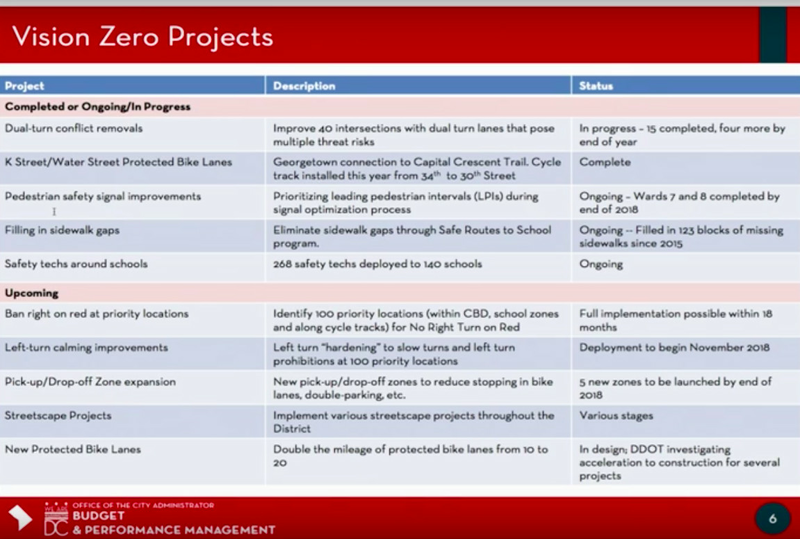 “What is particularly troublesome for us is the spike in pedestrian, bicyclist, and motorcycle fatalities,” District Department of Transportation Director Jeff Marootian told lawmakers at a regularly scheduled breakfast meeting between Bowser and the D.C. Council on Tuesday. While voicing general support for Bowser’s refreshed Vision Zero push, several legislators suggested that success would be measured in data and changes in behavior. Prohibiting right turns during red lights at certain intersections “might be a good idea, but if you don’t have any enforcement on that, it’s not going to make any difference,” said David Grosso, an at-large councilmember. He called for more red-light cameras and dedicated lanes in the city. Police Chief Peter Newsham said officers stopped drivers about 60,000 times in 2017, a number he said remains relatively constant each year. Newsham added that police were considering increasing the number of red-light cameras in D.C. and that “enforcement is critical for us.” Bowser said officials were looking into enabling the Department of Public Works to take photos of drivers who block bike lanes so tickets could be sent in the mail. 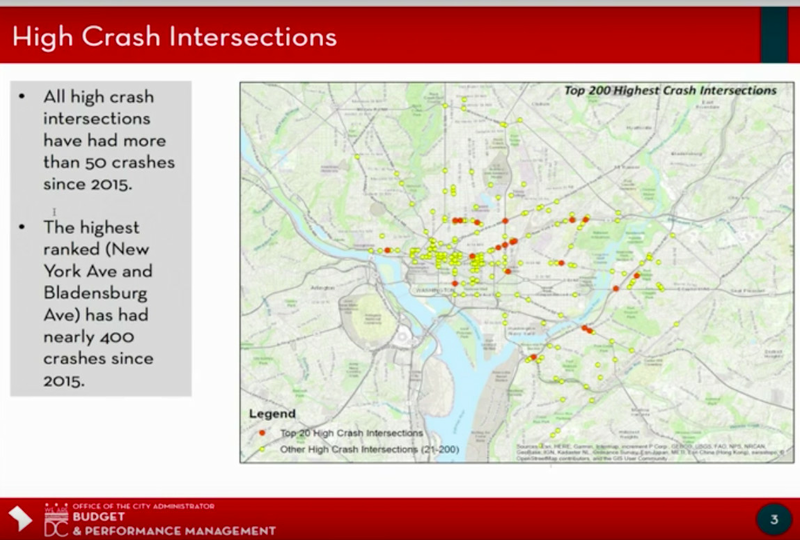 The Bowser administration shared a map of the intersections that have witnessed the most crashes since 2015. The highest-ranked—New York Avenue and Bladensburg Road NE—has had almost 400 crashes in that time. Marootian told lawmakers that the Minnesota Avenue and Benning Road NE and 14th and U streets NW intersections were also prone to crashes. The District’s Vision Zero plan calls for eliminating road deaths and serious injuries by 2024.